Camping in severe summer weather can be unpleasant if you’re not ready for it. Unlike a gentle summer shower, a powerful thunderstorm can take all the fun out of things. Same goes for starting out in calm 90-degree heat down in a valley. To limit unexpected surprises, check camping weather forecasts online. These services are easy to use: Simply enter the zip code of your destination and you can get a weather forecast for that region for up to 15 days in advance. Some weather forecast sites can also text weather updates to your smartphone—you’ll need a mobile signal, of course. If your camping plans take you to wilderness areas where—heaven forbid—cell phone service is non-existent, weather radios are reliable backups. These range from simple battery-operated weather alert units and crank-type radios that require no batteries, to CB radios with National Oceanic and Atmospheric Administration (NOAA) channels for use with your motorhome or tow vehicle. If it’s not clear skies, a light breeze and 73 degrees with 50 percent humidity, then it must be inclement weather, right? Here’s how to deal with all kinds of natural occurrences. Rain and Floods: These are perhaps the most underestimated dangers to campers. A downpour 5 miles away may appear to have no effect on you where you are…until thousands of gallons of untamed water come rushing down that dry riverbed and catches you unprepared. Even if you’re on the high ground, what about the dusty old road you drove in on? It could be days before help can reach you. And don’t even think about driving your rig across that “shallow” stream. It only takes 18 to 24 inches of water to float the average vehicle. And once you start bobbing, your steering wheel is useless. Trying to cross on foot is even more dangerous as moving water in incredibly powerful. It’s best to stay on high ground until the water subsides. Winds: Contrary to what you might expect, hiking or camping in a forest offers very little protection against high winds—especially at upper elevations where trees are likely to have shallow roots. These trees can blow over easily and fill the air with flying, debris and branches. If high winds descend upon you, seek shelter in a heavy, solid structure, a large, stable rock formation or a cave. Out on flatlands without ground cover, blowing dirt and gravel pose a serious hazard, so find shelter. Don’t be the tallest object around. If you’re in an open field get as low as you can, but don’t lie flat on the ground. Instead, squat down on the balls of your feet. The idea is to be as small as possible and have as little contact with the ground as you can. If you’re carrying a backpack get rid of it. It doesn’t attract lightning, but dropping the extra weight means you can get to shelter faster. Don’t be near the tallest object around, such as a solitary tree. Lightning is attracted to the thing closest to it and seeking shelter at the base of a large tree is often what causes people to get struck. There are no reliable warning signs that lightning is about to strike. Don’t depend on your hair standing on end to clue you in. If your hair does stand up, take steps to protect yourself. Get inside your RV or motor vehicle if you can, or a solid wooden structure. Avoid tents and stay away from metal awnings that shelter picnic tables. There is no safe distance from a thunderstorm. 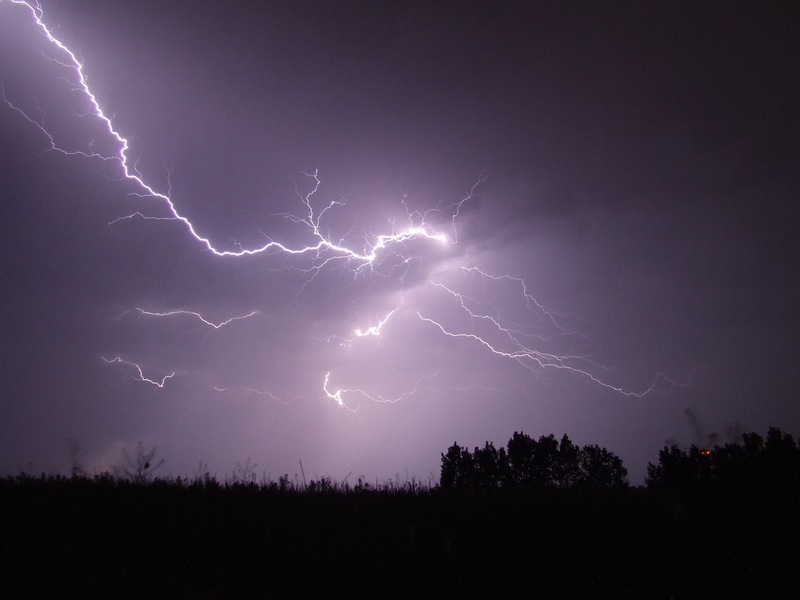 Lightning has been known to travel miles before striking the ground. If you can see it, you should take shelter. Follow the 30/30 rule. 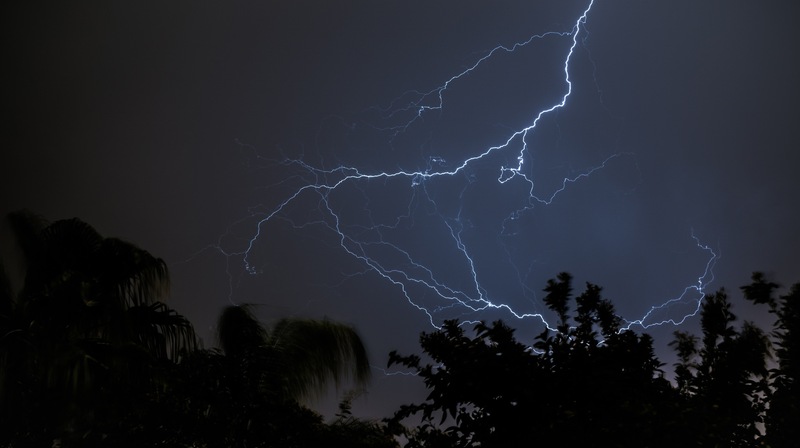 If you see a flash and thunder reaches you in 30 seconds or less, get under shelter. And wait 30 minutes after the last lightning and thunder before resuming your activities. If you venture into hot zones, you should be prepared for the conditions. Living in an air-conditioned motorhome or trailer can make places with names like Furnace Gulch or Anvil Flats more bearable—as long as you have AC power. But you need to be prepared should that power fail. If you’re in a tent, forget it. Thin nylon walls offer absolutely no comfort from blistering heat. Here’s how to prepare in other ways. Hot Weather Clothing: Your body cools off in warm climates through sweating. So be sure your wardrobe includes light colored fabrics that reflect the sun’s rays away and that can vent off perspiration. Polyester and nylon work well and dry quickly. And a hat (not a visor) is an absolute must to keep your head from overheating. Hot Weather Gear: Leave your winter-rated sleeping bag at home and equip yourself with lighter, cooler bedding for a hot trip. If you’re tent camping, it will be hot and stuffy in the warm months. Remove the rain fly from the roof to help cool off, or sleep outdoors on a sleeping pad. Of course you might have to slather on the DEET spray to keep ravenous bugs at bay while you sleep. Finally, use two ice coolers, one for drinks and one for food. The ice in the food chest will last longer than the drink chest, which will be opened more frequently by thirsty campers. Stay Hydrated: As long as you sweat you’re losing water, and as you learned in biology, the human body needs plenty of H2O to function properly. So make sure you have lots of fluids on hand. Find Shade: If you can, park your RV or pitch your tent in a shady area to keep out of the sun. If you can’t find shade, create your own by tying a tarp between some trees. Also, be sure to apply plenty of waterproof sunscreen and lip balm that’s at least SPF 30. Small Country Campground wants to ensure the safety of all campers during the severe summer weather months here in Virginia, and any other place you may be camping. We hope you’ve found this guide helpful.